Close to the time that braces will be removed, your individual retainers will be discussed. Your initial retainers are included in the original treatment fee. At the time your braces are removed, you will receive both verbal and written instructions for the care of your retainers. Removing braces signals the start of the retention and observation period of your orthodontic care. Please remember the retention phase of your orthodontic treatment is just as important as the active movement phase in determining the ultimate long term success of your treatment. Once the teeth have been moved into their desired positions, a period of time is needed to stabilize the surrounding bone and soft tissue to your new dental alignment. Orthodontists are aware that if retainers are discontinued, there will be changes in tooth position. The position and fit of teeth generally change throughout your life, with or without orthodontic treatment. Our goal in the retention phase of your treatment is to limit these changes while maintaining both a good functional and aesthetic result. Because teeth can continue to move throughout life, it is important for individuals who have completed orthodontic treatment to wear retainers for life. In some cases it is necessary to wear the retainers 24/7 for the first 6 months, only taking them out for eating and cleaning. In most cases it is necessary to wear the retainers 12 hours per day for the first 3 months. After that, you should plan on wearing your retainers, at night time, indefinitely. Retainers do eventually “wear out” – replacement is advised to preserve your investment. Keeping the retainer either in the mouth or in the retainer case will avoid loss or breakage which would lead to extra expense for replacement. Do not wrap them in Kleenex, napkins, etc. They can be inadvertently thrown away. Brushing the retainer with cool water and toothpaste and soaking it in a cleanser or mouthwash periodically will keep it fresh. (However, Listerine may discolor your retainer.) Never place your retainer in hot water, as it will become distorted and require replacement. If a brush is not available after eating, rinse off your retainer and place it back in your mouth or in its case. Beware of putting your retainer in a pocket where it might become broken. Also, avoid leaving it out, especially where pets could find it or where it may become lost. What If A Retainer Is Not Fitting Properly? Do not hesitate to call our office if your retainer is fitting poorly or not fitting at all. Some patients postpone calling the office because the poor fit is the result of not wearing the retainer as directed. Regardless of what has caused the poor fit, the sooner you come in the less chance there is that significant shifting will occur. Phone the office right away for an appointment to replace or repair the retainer. Although there is a charge for replacement or repair, it is a relatively inexpensive amount toward protecting the investment you have made in your orthodontic care. 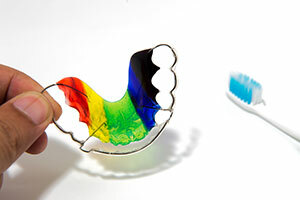 Because retainers are worn for years, they will need to be replaced periodically.